I've got an admission to make: I've never used any of the Microsoft Ajax Toolkit. But recently I've been adding some mapping functionality to the project I'm working on. We wanted users to be able to pull a marker to a position on a map and have the new position updated on the server. Obviously we were going to have to use Ajax of some kind to do that. What I want to show today is how trivially easy it's proved to be to use MVC Framework on the server and jQuery on the browser to do Ajax requests and updates. JQuery is now included in the default project for the MVC Framework, so there's no excuse not to use it. All we have to do to retrieve the Name of the person is to name the argument of the action 'Name'. 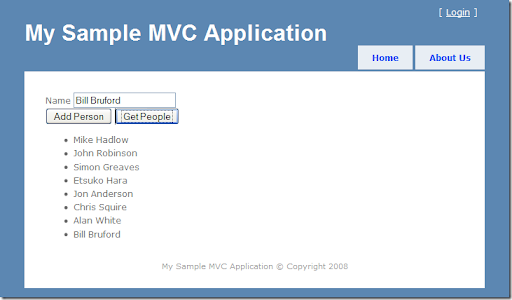 The MVC Framework automatically pulls apart the request, finds a value called 'Name' and supplies it to the action. If you have a complex JSON structure you can deserialize it to a C# object using the built in data binding. All that's left to do is create a new Person instance with the given name and save it to the database. Nice! I'm a latecomer to the Ajax party, but with jQuery and the MVC Framework I'm finding a breeze to wire up some pretty nice functionality. Very good example. I was wondering how json works with MVC, but this really gave me a good understanding. Kudos to you! Superb article. I was able to quickly understand how to use JQuery with MVC. Great stuff! I'd done a little AJAX under web forms but this makes it very easy to transition and the jquery is cool. Thanks for the example!